For those that didn't know, July is National Baked Bean Month. Baked Bean Month is most fitting for July when we have bbqs as well, since baked beans go great as a side with those BBQ's or those family reunions this year. Great as a side with hot dogs, burgers, steaks and more.Their actually the 3rd most eaten side dish food even when cooking out! They can even be cooked on the grill. Baked beans are also high in protein and contain more fiber than most whole grain foods. 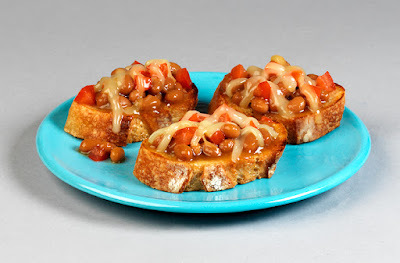 Recipe created for BUSH’S® Beans by Kristen Doyle, freelance writer and blogger of popular Dine & Dish, mother and member of BUSH’S Culinary Solutions Blogger Panel. 1. Preheat oven on broiler setting. 2. Heat beans in small saucepan over medium heat until warm, about 5 minutes. 3. Place baguette slices on cookie sheet. Rub each slice with garlic, then spread butter over each slice. 5. Using oven mitts, remove cookie sheet from oven. Using slotted spoon, top each toasted slice with generous spoonful of beans, tomato and cheese. 6. Return to oven for 1-2 minutes, or until cheese is melted. Serve.